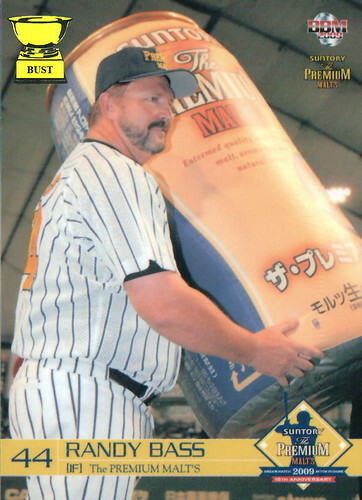 Get ready for another edition of The Caption, which may have been translated from some Japanese newspaper or other, as far as you know: "Pro Japanese baseball legend Randy Bass holds up a giant, inflatable can advertising Suntory Premium Malts during an old-timers all-star game Sunday in Tokyo. The evening took an ugly turn after the game, however, when Bass learned that the can was not, in fact, filled with delicious malt liquor, and in retaliation looted a nearby convenience store, drinking every 40-ounce bottle of less-than-premium alcohol he could find. Police have estimated that the damage is close to a million yen."